Ann Votaw, Hoosier by birth, New Yorker by choice, was resigned to having seen the last of the limelight. A dancer whose professional work ranged from an unglamorous cruise ship to stage plays, she is in her mid-40s and having a career that ex-dancers often turn to -- fitness instructor. In a senior center. It ain’t showbiz, but she likes it, it delivers a regular paycheck and beats the grind of taking long lunch breaks on temp jobs to go on auditions, hoping not just to get a part with the hoofers, but maybe one with a few lines. It’s how thousands of performers in New York City find their way to the next thing, especially dancers. Eventually time catches up – with your feet, your knees, your face. So when her neighborhood in upper Manhattan held a tree-lighting party last Christmas, she was asked to play Mrs. Claus and do the honors. She pieced together an outfit from Amazon and thrift stores, and arrived to do her best. To call it life-changing is an understatement, she says. Which is how Votaw, now 44, found herself in Midland, Mich., for a long weekend in October, a scholarship student at the Charles W. Howard Santa Claus School. In between, they’ll be taken on field trips to meet live reindeer or ride the train that was used in the “Polar Express” film. Of course they stop at Bronner’s Christmas Wonderland in Frankenmuth. They eat, party and socialize. Everyone comes with a stack of business cards and comes home with a different stack of everyone else’s. Because Santa is big business. Some of these guys are mall Santas, more of them solo operators. Most are retired, a surprising number from jobs where they were not permitted to grow and cultivate the lavish facial hair a real-beard Santa needs. And most are real-beard Santas, which they and Votaw pronounce as one word: Realbeards. Realbeards are the real deal, men who take the job as seriously as any parent of a young child would want them to. In the off season, they hang out on the internet and talk about their issues -- whether to bleach their beards year-round, for instance, because children don’t forget about Santa in July. And the Santa school is a business, if not big, then at least colorful. During this year’s school, journalists came from outlets as diverse as Agence France Presse and, yes, Deadline Detroit. Tom and Holly (her real name) Valent have run the school since 1987, and it’s safe to say that, like Ebenezer Scrooge after his night of terror, they know how to keep Christmas well. Tom runs the Christmas House in Midland, where he designs all the displays. The two have taught Santa schools around the world. They keep reindeer as pets. They wear a lot of red. Almost everybody at this year’s Santa school wore red, in fact, and walking into the Midland Center for the Arts the morning of the second day of classes was a little disorienting; long-haired, white-bearded gentlemen with round bellies were everywhere, but not in full regalia, so the effect was more like a lot of aging bikers or Leon Russell impersonators in red T-shirts and Henleys. Votaw wore a red blazer she found in a thrift store, along with a swingy skirt, a beret and a fanny pack with two pouches. Her dancer’s figure is still slim, her legs shapely with muscle, so the effect didn’t read as Mrs. Claus Civvies so much as New York Casual, and that's fine, she said. If Votaw’s sounds like a feminist Mrs. Claus, it’s by design. That’s one advantage of being the spouse -- less history to live up to, more room to make her your own. Santa Claus, after all, is based on St. Nicholas, a fourth-century saint, and if he had a spouse, it isn’t recorded in the historic record. So why not make her your own? It’s what actors do, after all. Santa portrayers give a great deal of thought to who their Santas are, outside of the broad outlines of the legend. If you’re going to bleach your beard in July, you aren’t going to neglect the essence of your character. The job is a big one, entirely self-assumed. And so complicated – besides the performance, there are myriad other issues to playing Santa Claus. The clothes, the booking, the payment, the tug of competing interests – charity vs. financial, mostly. Lots of these guys do pro bono work, in hospitals and schools, but they also don’t hesitate to point out how expensive it can be, bringing Santa to the world. The clothes alone cost a fortune, because the difference between a cheap Chinese-made costume and a good one is hundreds of dollars. Ditto for the boots, ditto for the belt. And if you’re not a realbeard, a good false one in another few hundred bucks. “I charge $350 an hour,” said Richard Hyman, 72, who lives near Atlanta but relocates to Miami for the holidays, in part because there are more Santas in Georgia than anywhere else in the country, he said, “500 in Atlanta alone.” Market forces dictate an Atlanta Santa would be lucky to get $200 an hour. But in Florida, he can do well enough to make it worth renting a house there for a month and a half. Not that working in Miami is a picnic – you try wearing a North Pole costume in a place with palm trees and humidity – but, like Votaw and many others in Midland that weekend, being Santa isn’t simply playing a part. “Putting on the suit?” Hyman said. “It’s almost magical.” It has a life of its own, like the red shoes in the Hans Christian Andersen fairy tale. That it typically takes a couple hours to get fully ready – the hair and beard alone take serious work with a curling iron – doesn’t diminish it at all. Still, for all the magic and twinkly lights and Christmas cookies, there is contemporary reality to acknowledge, and accommodate. Besides the aforementioned costume costs, there’s also background checks. Liability insurance. Keeping those white-gloved hands in sight at all times, especially when holding a squirming child on your lap. Other downsides: Shopping malls, where millions of American children sit on Santa’s lap, are either going away or changing their approach to Santa encounters, including scheduling lap time. Something you probably didn’t know: Mall Santas are hired by photo companies, which are having an even harder time than malls, in part because of the aforementioned camera-in-every-pocket phenomenon. So Tom Cortemeglia, who came to Midland from Nashville, Tenn., came up with his own solution: He partners with a photographer and rents space in a strip-mall Smoothie King, where they are free to set their own hours and make their own rules – welcoming pets, for instance. If you buy a picture, you get a dollar off a smoothie. It works for him. Cortemeglia also came to Midland with his own merch pop-up, and went around Saturday in a T-shirt reading “Jolly fat man seeking summertime employment.” Santas often need this sort of side hustle to make the pro bono visits to children’s shelters and special-needs classrooms workable, he said. Of his distinct Tennessee accent, he tells children he picked it up at the South Pole. Issa Kassissieh stands out in this sea of white hair and round bellies. He’s young, for one thing, his dark hair and beard un-Santa-like. Like Votaw, he’s one of the minority of Santa personae here who is more or less height- and weight-proportionate. But he has a card, too, and proffers it; it features a photo of himself in full regalia, ringing a bell astride a camel. To the left of the camel’s nose can be seen a landmark known around the world – the Temple Mount, with its gold-clad Dome of the Rock. 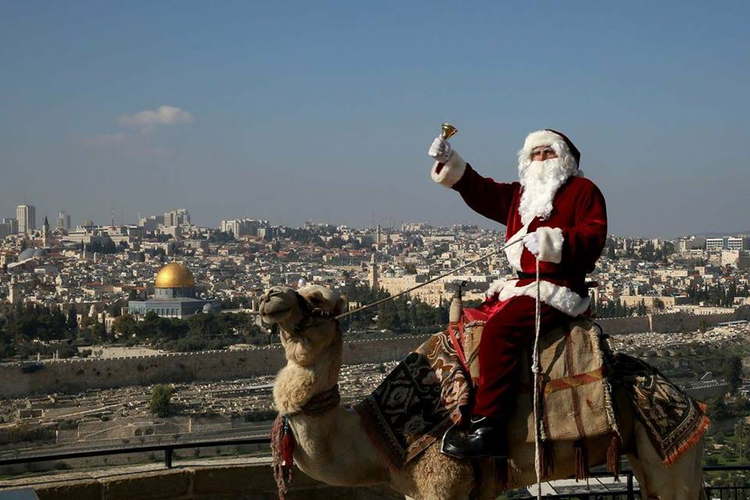 Just in case you aren’t up on your world geography, flip the card over: Jerusalem Santa. Ho ho Holy Land. Christians only make up 2 percent of Israel’s population, but this descendent of Greeks thinks all children want a little Santa at Christmastime, and he’s assumed the part. Children of all faiths, he adds, all of whom are welcome. In this place where [you’d think] the religious elements of Christmas would be top-of-mind, Kassissieh seeks to bring the more secular version, the one with cookies and presents and the white-bearded figure who brings them. There’s a Nativity scene in the house, because this is the Holy Land, but Santa, as far as Kassissieh is concerned, is about “peace, joy and happiness,” not just for Christians but anyone who wants them – and Jerusalem, riven by religion, is always in need of a little more of all that. “I put on my red suit for children to be happy,” he said. It’s easy to get a little cynical about Christmas here, even while stuffing another ginger snap into your maw. So much talk of business, of taxes, of the importance of social media and continuing Santa education. Which may be why the Valents reserved one session of the school for a visit by a local kindergarten class, who interacted with Tom in character as you-know-who. The kids were brought onto the arts center stage behind a curtain and told they’d be meeting some important people. When the curtains opened, revealing that sea of red shirts and white beards, five-year-old jaws dropped. These, they were told, were “Santa’s cousins.” Soon, Tom made his entrance by a side door, bells a-jingle. To say he commanded the room would be an understatement. No kindergartener wants to get on the naughty list this close to D-day, and one girl, overwhelmed by it all, kept her face hidden in her mother’s stomach the whole time. Valent put a red nose on one boy, led the room in singing “Rudolph the Red-Nosed Reindeer,” sat on a chair with his name carved into the back and ho-ho’d his way through a credible performance as a busy guy making a little time for a visit with some kids – and his cousins. “I have to get back to the North Pole,” he said, making his exit. Later that night, after the visit to the Polar Express and the standard chicken dinner at the Bavarian Inn, Bob Saintsing, a Santa just past his rookie year, reflected on the secret of his success. He’s just 60, not fully white in the beard yet, but he doesn’t bleach and says he’s never had a child ask why there are still gray streaks in there. He revealed his own strategy for gaining children’s trust: A stool. “It’s scary to be put on someone’s lap you don’t know,” said the North Chesterfield, Va., resident said. He invites them to sit at his knee on the stool, and starts the conversation casually, not with “what do you want for Christmas,” but more low-key. Kids love it so much some will go through the line again, just for the chance to pick up where they left off talking about their siblings and Christmas wishes. He’ll sometimes ask them when they were nice, and when they were naughty, and they happily oblige. “One parent said she’d never seen a Santa like [me] before,” Saintsing said. He takes it as a compliment. And he’s not planning to change his beard at all; he’s had it for 40 years. He may actually be Santa Claus. Votaw finished the weekend, building a penguin push toy in the Santa’s-workshop visit and boarding her flight back to the east coast. The transformation she first felt a year ago has not dimmed, she reports. She’s buying white fur to trim outfits, and has a couple of human-hair wigs to rotate through her appearances. 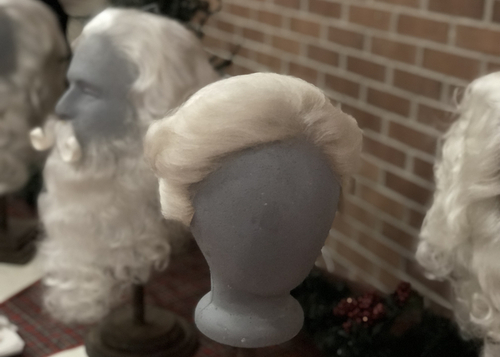 “I am getting three Mrs. Claus inquiries a day,” she said, although few bookings, because most want to hire Santa, not his spouse. “Most of them are ridiculous but fascinating. Like going to Staten Island for a baby christening.” She was also invited back to Indiana to ride the Holly Trolley for her hometown’s tree-lighting in Fort Wayne. She now has a stack of business cards, just like the realbeards. They say, "Caught being nice." It’s annoying when potential gigs ask why she can’t bring her “husband,” but that’s not her problem, she figures. 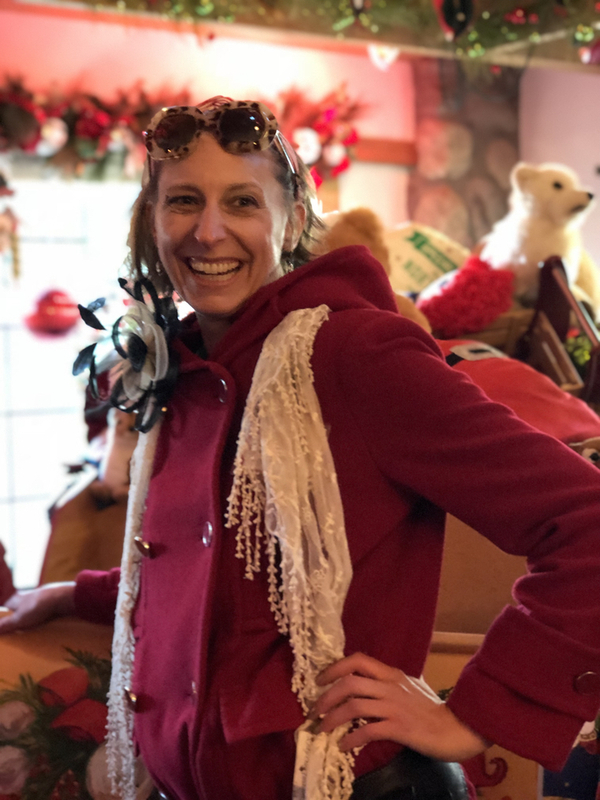 Her Mrs. Claus is new territory to be explored and expanded upon, a feminine spirit of giving and kindness, generosity and fun in the darkest time of the year.